RBTH presents a selection of views from leading Russian media on international events, featuring reports on Russian Foreign Minister Sergei Lavrov’s meeting with U.S. Secretary of State John Kerry in New York, a new program intended to expand internet coverage in Russia, and the problems facing Russia’s chocolate industry. 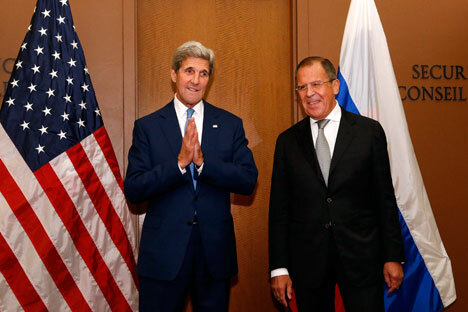 The U.S. and Russian leaderships share an "understanding of the need to cooperate closely" on Syria, according to Russian Foreign Minister Sergei Lavrov, who was speaking after his third meeting with U.S. Secretary of State John Kerry on the margins of the General Assembly of the United Nations in New York, reports the business daily Kommersant. According to Lavrov, he and Kerry went through the agreements that were reached at the meeting of presidents Vladimir Putin and Barack Obama on Sept. 28. "The first of these agreements is about the need for close contact between our military," Lavrov said. Lavrov also commented on a change in the U.S. position on the future of Syrian President Bashar al-Assad. "Life has convinced them [the U.S. – RBTH] that it is unrealistic to demand the departure of the president in an ultimatum-like manner, when there is such a crisis in the country." A program for the development of the Russian segment of the internet until 2025 is soon to be submitted to the presidential administration, and then to the head of state, reports the centrist daily Nezavisimaya Gazeta. In the next 10 years, it is proposed to ensure the “digital sovereignty” of Russia, to provide the entire country with internet coverage, to solve the problems of the so-called “import substitution” of software and many other things, writes Nezavisimaya Gazeta. The program prescribes several options for implementing the plan of import substitution – either to create a system of national standards to help Russian developers, or to introduce a special registry for them, into which foreign companies will be able to be included only with great difficulty. There are plans to allocate public funds for research and experimental development and at the same time to increase the customs duty on the import of finished foreign products, but to cancel it for components. It is assumed that this will force foreign firms to move the assembly and even the production of gadgets to Russia. A special section of the program is dedicated to education: It is proposed to issue grants for the training of specialists for their commitment to further work in Russia. In such a way, Russia plans to effectively make up for the opportunities lost in the 2000s. That is, to try to follow the path of India, where a real IT-revolution has occurred in the meantime, writes the newspaper. "There has become less imported chocolate; imports have fallen by 50 percent due to the devaluation of the ruble and weakening demand, but domestic chocolatiers have turned out to be physically unable to replace the lost volumes, reports the RBK business daily. According to the Rosstat state statistics service, imported chocolate accounted for 15 percent of the Russian chocolate market in the past few years, says the newspaper. This year, imports started to fall sharply. During the first seven months of 2015, they decreased by almost two times compared to the same period of the previous year. Experts with the Russian Research Center of the Confectionery Market (TsIKR) believe that problems with the replacement of imported chocolate are due to the fact that Russian-made confectionery and imports occupied different price niches. "The weakening of the ruble exchange rate, declining consumer demand, rising production and manufacturing costs are not conducive to the expansion of Russian manufacturers' assortment lines toward the above-standard and especially premium segments," said Yelizaveta Nikitina, the center's executive director. In her opinion, import substitution in the production of chocolate and sugar confectionery could be furthered by the lowering of fiscal and administrative barriers.